Bigcommerce is one of the best e-commerce website builders out there. It has a powerful interface which lets you build an online store with ease. It lets you run your entire business from the Bigcommerce control panel via the comprehensive CMS. Manage products, pages, or even launch a blog for your online shop, all without any coding knowledge and from the same dashboard. The themes below are free Bigcommerce themes that are fully responsive, meaning they will look perfect on any device. Most of them come with a sleek frontpage slideshow and a ton of awesome features, such as a complex search filtering system, customizable product selector, cart suggested products, advanced quick view, one-page checkout, customized check out, and more. The themes are optimized for sales and offering discounts to your customers and were tested on Chrome, Firefox, Safari, IE 10+. Bigcommerce also offers free customer support and free theme upgrades. Check out their features below! Cornerstone Light is a free Bigcommerce theme that can be used by almost any niche. It has a fully responsive design with a clean and simple structure. You can easily add your own branding details, such as logo and colors. Building a beautiful and fully functional online store is easy with this template. It contains a bunch of features useful for any type of online store, such as a homepage carousel, social media icons, featured and top selling products, and even faceted search. The Theme Editor lets you quickly tweak its style, without any coding knowledge. This minimalist theme will look perfect on both desktop and mobile devices, which is a must nowadays as traffic from mobile devices is continuously increasing. The theme has a neutral design with a white background. You can change the colors easily and adapt the theme for selling anything from clothing to appliances and more. 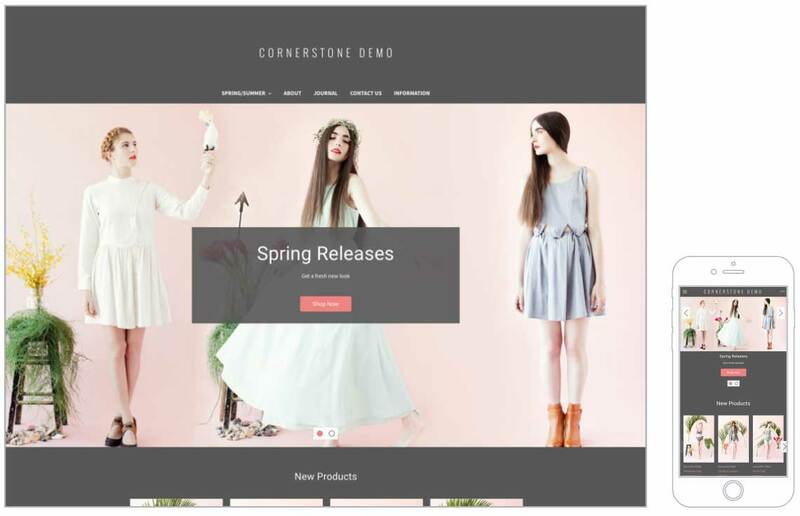 If you’re looking for a clean theme to start your online store with Bigcommerce, Cornerstone Light is the best choice. 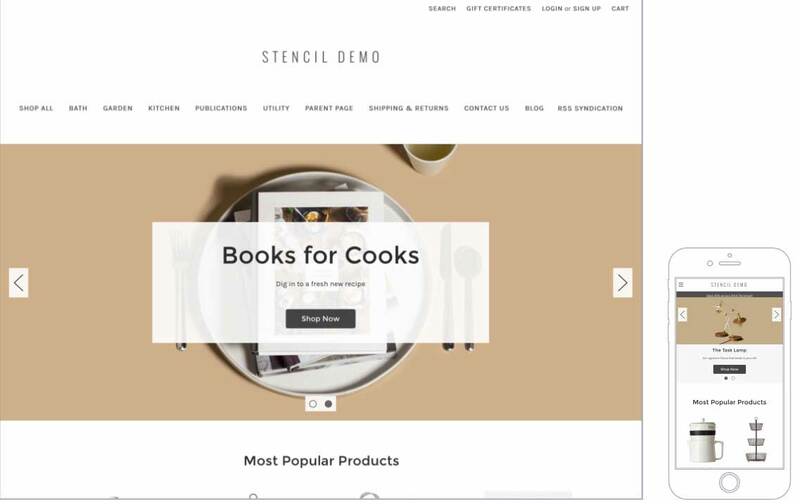 This brand-neutral free Bigcommerce theme will give you all the tools you need to launch your business online. This is the sister-theme of Cornerstone Light, and as its name states, it is the bolder version. This version has a completely dark background paired with white text and beautiful imagery. It is a great free theme for an online store in any niche. Sell music, clothes, books, software electronics, and more. it is adaptable and offers all the needed features for a successful online store. This free Bigcommerce theme has a fully responsive design for a mobile-optimized store. it is also image-oriented – letting you showcase the products in a simple, yet visually-appealing manner. It is optimized for sales & discounts and stores with a large catalog of products. free theme upgrades, and more! 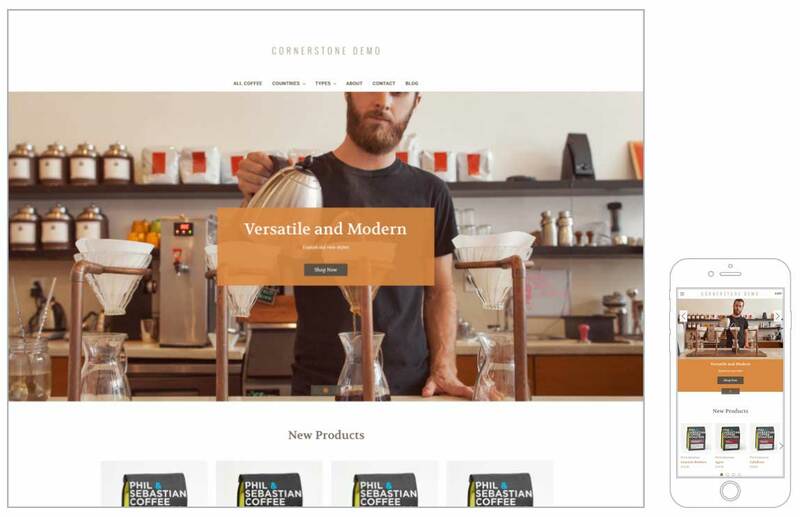 Cornerstone Warm is another version of the free Cornerstone themes for Bigcommerce. 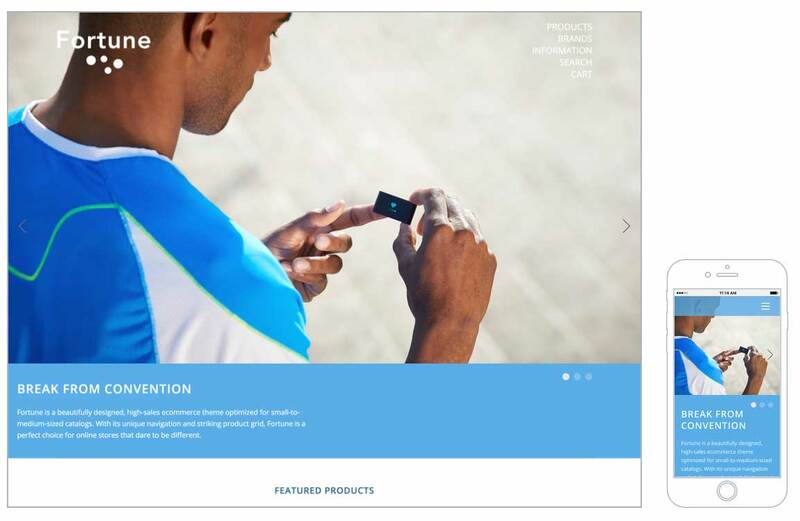 It has a nice carousel slider on the home page, so you can showcase select products or offers. It uses clean typography and has a user-friendly design. This theme is perfect for any kind f store, so use it for your apparel & clothing business, cosmetic stores, jewelry websites, and more. This theme’s beautiful design is paired with a clean and user-friendly layout. It is particularly optimized for online stores that have many product categories. Fortune is a gorgeous free Bigcommerce template for professional-looking online stores. It uses a striking hero area for catching the visitors’ attention. Use it to showcase your products or latest offers. Powered by a sleek navigation system, this theme will be extremely easy to use by any visitors, so don’t worry about losing customers due to UX issues. 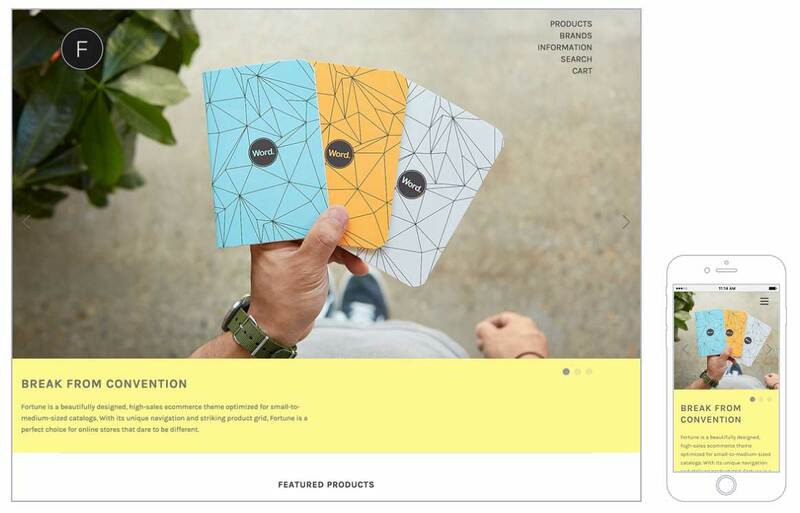 It focuses on beautiful images and lets you display the products in a unique product grid. Use this theme if your business has small-to-medium-sized product catalogs. This free Bigcommerce theme is also fully responsive, so it will look perfect on any device. It has a complex search filtering system with a customizable product selector. You can suggest other products in the cart page, making up-selling extremely easy, and comes with an advanced quick view option, persistent cart feature and one page check out. Fortune Bright is the sister theme of Fortune Minimal. As its name states, it has a bright, clean design that’s also neutral and adapted for websites selling apparel. The UX is well-thought, ensuring a simple user flow for maximum conversion rates, thus bringing you more sales. Use it for any kind of online business and e-commerce store, as its design is easily adaptable to any niche. This free Bigcommerce theme looks perfect on Chrome, Firefox, Safari, IE 10+ and mobile, tablet, & desktop devices. It will render beautifully on all devices, both desktop and mobile. It is powered by Google AMP, contains a customized Check-Out and a quick Add-to-Cart, plus, it is optimized for Pixelpop. Fortune Contrast is the dark version of the free Fortune Bigcommerce theme. It was built with a “mobile-first” approach – which means it is fully responsive. This theme maintains the clean design of its predecessors while having a dark color palette which can be changed according to your branding details. This free Bigcommerce template features a vertical navigation menu located at the top right corner of the screen. This free Bigcommerce theme is perfect for any type of online store that doesn’t have too many product categories. Fortune Highlight is a free Bigcommerce theme with a similar design to the other Fortune themes. It has a simple design, with a large slider on the homepage which you can use to feature your products and latest discount offers. 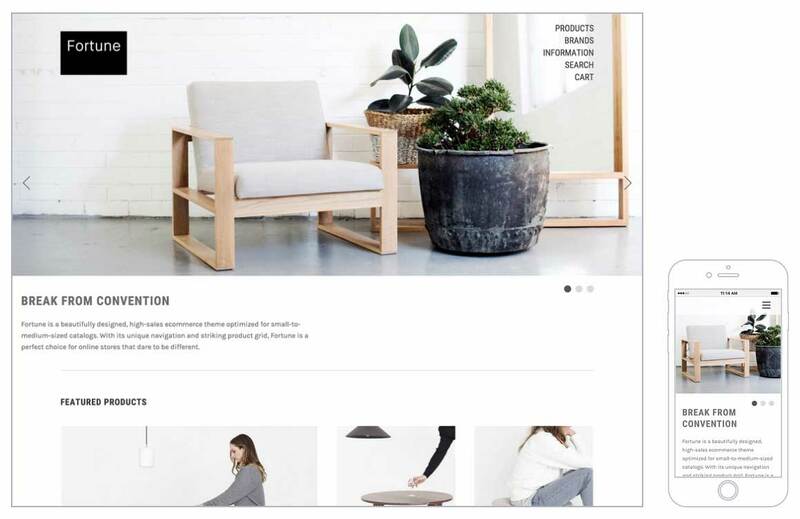 This beautiful, free Bigcommerce template can be used by any type of e-commerce stores that need a design that’s clean, with a “quick view” feature and many customization options. This theme features product showcase elements, persistent cart, one page Check Out, product videos, and more. 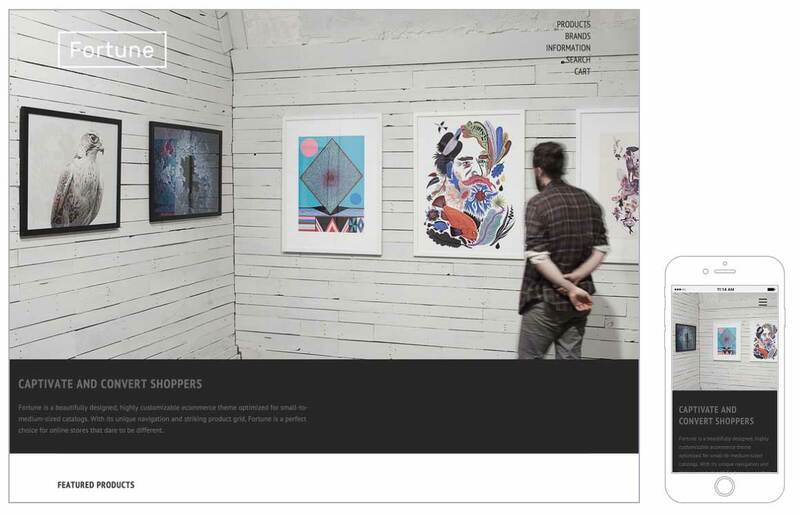 It has a masonry design for the products gallery and it is powered by Google AMP for quick loading.